This post was contributed by guest blogger, Jessica Sacher, a microbiology PhD student at the University of Alberta studying with the Szymanski lab. Bacteriophages (viruses that prey on bacteria) may be the most numerous and most diverse biological entities on our planet, but we still know collectively little about how they infect and influence the evolution of their bacterial prey. Currently, receptor binding proteins (RBPs, the host recognition factors of phages) constitute one of the most popular classes of phage proteins to study. These are highly useful for the biotech industry, which is in the process of capitalizing on phage RBPs as diagnostic tools and therapeutics. In addition, the strategic use of whole phages as therapeutics, which is also gaining a lot of new traction lately (1, 2), depends on knowledge of the structure(s) a given phage will recognize on a host cell. This post was contributed by guest blogger, Kristian Laursen from Cornell University. Site directed mutagenesis is a highly versatile technique that can be used to introduce specific nucleotide substitutions (or deletions) in a tailored manner. The approach can be used in conventional cloning (to introduce or remove restriction sites), in mapping of regulatory elements (to mutate promoters/enhancers in reporter constructs), in functional analysis of proteins (to perform alanine scanning mutagenesis or targeted substitution of key residues), and in SNP analysis (to introduce naturally occuring SNPs in a plasmid context). The technique is also highly relevant in this age of CRISPR; site-directed mutagenesis generally applies to plasmids, but may also facilitate genome editing. Tailored mutations are commonly introduced to endogeneous DNA through homology-directed repair (HDR) of a CRISPR/Cas9 induced double-stranded break. This site-directed genome editing requires a template of high homology to the endogenous target, yet to facilitate the repair, the template should be resistant to Cas9 cleavage. 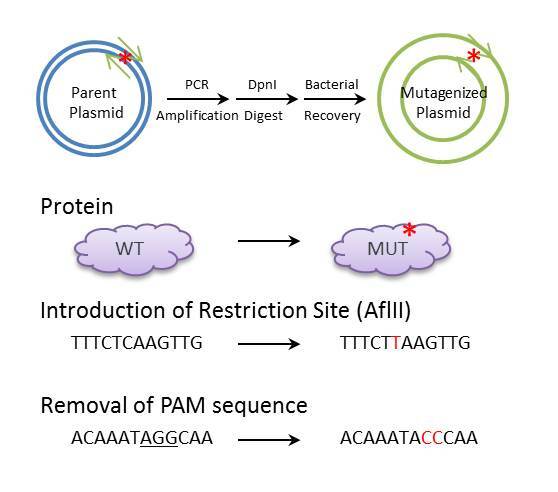 If a plasmid contains the template, site-directed mutagenesis can be used to mutate the PAM sequence (an NGG sequence critical for Cas9 cleavage), thereby rendering the resulting construct resistant to Cas9 induced cleavage. This post was contributed by guest blogger Beth Kenkel, a Research Assistant in the Department of Pediatrics at the University of Iowa. If you're interested in guest blogging, let us know! Molecular cloning requires some method of screening colonies for the presence of an insert. Traditionally this has been done with restriction enzyme digest; however colony PCR can accomplish the same thing in less time and for less money. The key steps to colony PCR are: 1) design primers to detect the presence of your insert; 2) set up a standard PCR reaction (primers, dNTPs, polymerase) using the supernatant of lysed bacteria as template; and 3) run your PCR product on a gel to analyze product size. This blog post discusses some of the key things to consider when performing colony PCR. 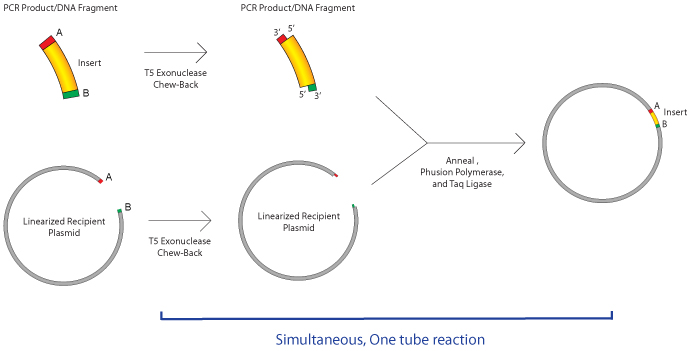 In its simplest form, PCR based cloning is about making a copy of a piece of DNA and at the same time adding restriction sites to the ends of that piece of DNA so that it can be easily cloned into a plasmid of interest. You can use similar processes to add overhangs to your insert of interest for Gibson assembly. The steps following primer design and the PCR process itself are very similar to those outlined in our restriction cloning post with a few quirks specific to the PCR cloning process - please check out that post if you need a more detailed refresher on the downstream steps. Over the past decade, scientists have developed and fine tuned many different ways to clone DNA fragments which have provided appealing alternatives to restriction enzyme cloning. These newer technologies have become more and more common, and for good reason. They offer many advantages over the traditional restriction enzyme cloning we once relied exclusively on. In this blog post, I will go over some advantages, disadvantages, and examples of how scientists are using Gibson assembly to put together DNA fragments.